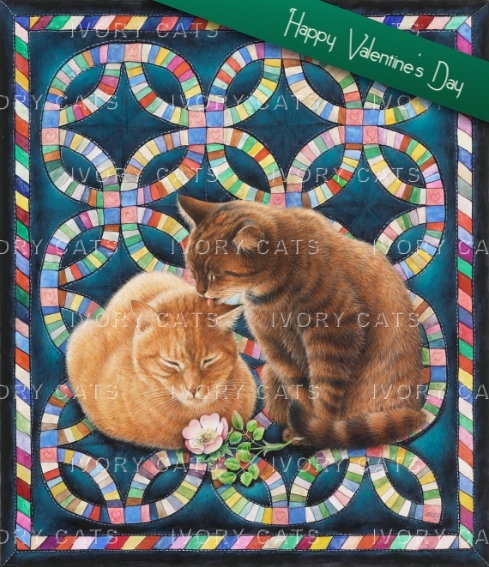 Soul mates, Spiro and Blossom are seated on a traditional Pennsylvanian quilt with wedding ring design. He has given her a wild rose. Spiro and Blossom were born under the same star in the same year in different places only a few weeks apart. They grew up together in our home from little kittens and were soul mates from the start, always side by side, completely in tune, quietly there for each other, often seen on the stairs, tails linked, surveying our family scene. They were a joy to have with us. This painting is for them as it represents a perfect relationship that lasted, an example to humanity. Happy Valentine's Day to everyone who feels the same. Lesley 2016.